A Paper Pumpkin Thing is back and yes I am little late this morning! The kids have kindly shared some sort of cooties... and it hit me with the One, Two Punch yesterday afternoon! Hopefully today is better! The kit this month is this amazingly adorable valentines kit! The Be Mine kit also coordinates with the Animal Expedition Suite in the Annual Catalog! I couldn't wait to play with this kit but with everything going on it didn't get the love I planned on showing it! 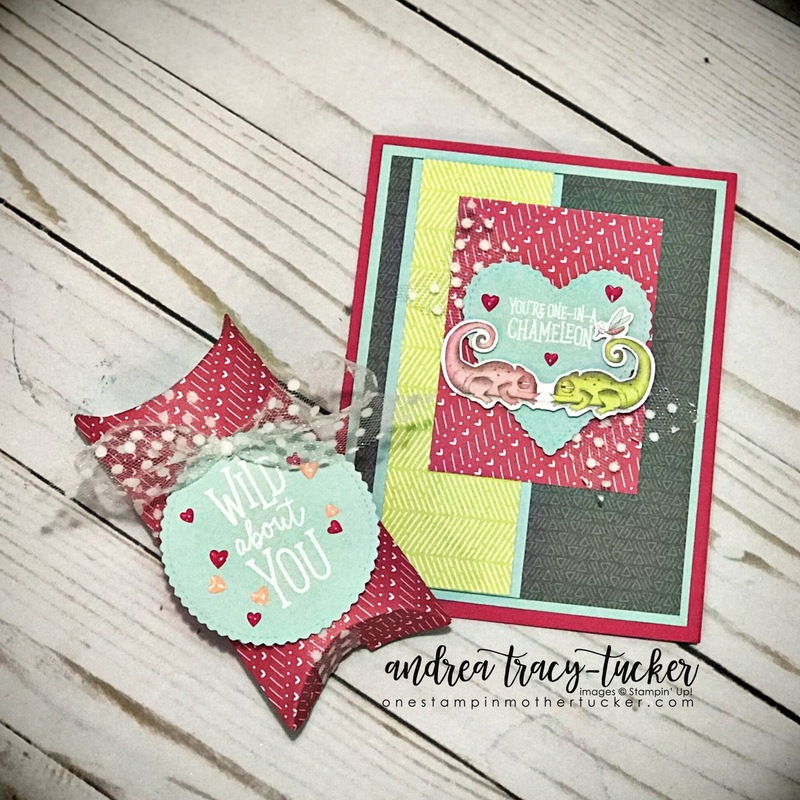 My Melon Mambo card with Pool Party mat was the perfect start to my cute Valentine inspired card. I have used the Animal Expedition DSP and it was perfect for my "You're One In Chameleon" with the cute little Chameleon die cut from the Paper Pumpkin kit. I accented the heart with a bit of the Whisper White Polka Dot Tulle to give it some foof! Yes, foof is a word! The pillow box I left alone, I simply tied the Polka Dot Tulle around the box with a nice heat embossed sentiment and enamel hearts for a tag! I can't wait to show you what everyone else has come up with! Just click along the link list below! Lovely alternate project ideas! Love the coordinating papers! Andrea... Love the card and 3D. Great alternative colors too. Hope you start feeling better. The addition of the ribbon is perfect and I like the pop of the white embossed words. I need to do that more often. I hope you are over your cooties and feeling better.